Composition for farmer, three dogs and 120 sheep - Auckland Art Gallery Installation Documentation from Alex Monteith on Vimeo. 3min documentation of the install of "Composition for farmer, three dogs and 120 sheep for four channel video installation" Alex Monteith, 18min, 2006, stereo sound. 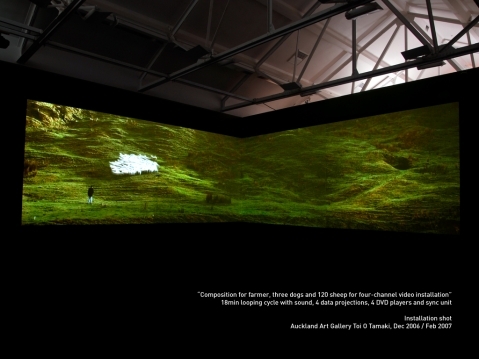 This clip is a 3min compile of shots of the work running at the Auckland City Art Gallery Toi o Tamati, Aotearoa NZ. Collaboration with Lloyd Bishop, a third generation championship dog-trialist on his hill-country station in Taranaki, New Zealand. Lloyd Bishop musters the sheep using three working dogs across from left to right. The sheep are mustered into the centre frame of each of the four simultaneously recording DV cameras. LLoyd musters the mob into the centre frame of camera 1 (Extreme left panel) and uses the dogs to hold the mob there for 2-3mins. He moves the mob to the right to the (central left panel) and holds the mob centre-frame for 2-3mins. He repeats the mod movement to the centre frames of cameras three (Mid right) and four (extreme right panel). Finally the mob is moved out of frame to the extreme right. The recordings are stitched together to form 4 panels comprising a seemless view of the hillside. The mustering performance is continuous with no cuts-meaning the muster had to be performed perfectly with no retakes from start to finish. The work was produced during the 2006 SCANZ residency for digital media artists.